Ok slowdown, you will need to be realistic. Let this be the year that you don’t go ballistic. The tomato plot can only support nine or ten. The baby’s coming, you’ll be helping Shannyn! Oh, the jungled isle of tomato varieties. So many!! … but with different similarities! Expansive tables, ran longer than from A to B. My cart was filled! Oh glee, what a great shopping spree! But 16 had to share space, with soil now more scant. Overgrown, tumbling, ripe red and starting to rot. But to my surprise, it was nowhere near all lost! Abundance of lush orbs, too many to count-ee! I’m so thankful for this unexpected bounty! 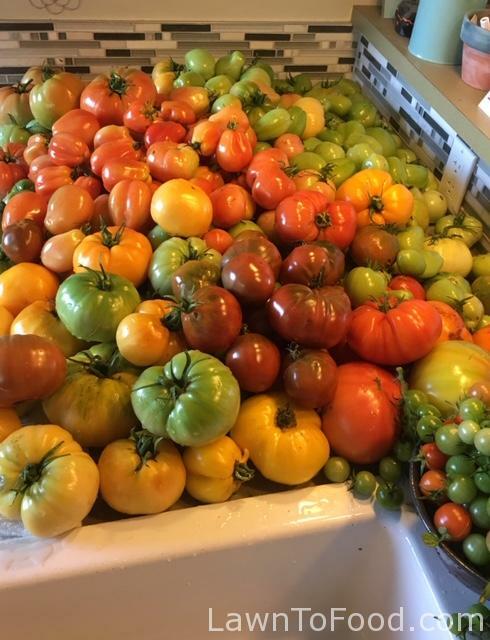 With these colourful tomatoes I canned small batches of tomato juice, yellow tomato curry base, a few jars of green tomato mincemeat for the holidays and green tomato & mango chutney for a Indian food condiment. About 10 of the perfect beefsteak tomatoes are at different stages of ripeness on our window sill.